Arc’teryx had climbing, bouldering and camping enthusiasts in mind while designing its new Arakys hybrid shoe, featuring Adaptive Fit Lite, the latest construction technology that shapes to the wearer’s foot. A shoe inspired by the best technical alpine footwear, but with added comfort and lightness. 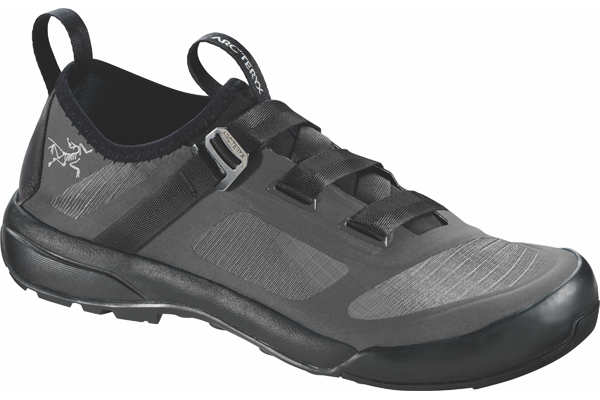 Based in North Vancouver, the outdoor performance apparel company known and loved by climbers and mountaineers around the world created a hybrid, lightweight shoe that lets you easily go from the indoor climbing wall to the most demanding cliff face. The Arakys model ($150) is also surprisingly comfortable on the trail or around the campsite. No more need to change shoes when you’re back on the ground. Climbers will be pleased with the collapsible heel and one-hand closure with memory buckle. The leather footbed makes it barefoot-friendly while the Vibram® Megagrip compound gives the outsole great flexibility and stability.